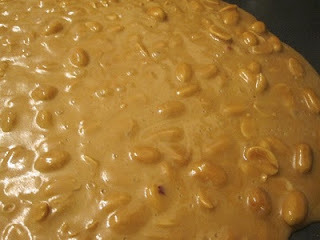 I don't know when I first tasted peanut brittle. My most vivid memory is from Christmas quite some time ago. It was definitely store bought, (I remember a tartan pattern on the box), but it was oh so good. I just couldn't stop eating it. I love it, but it's another thing that I kind of forget about until the Holidays. 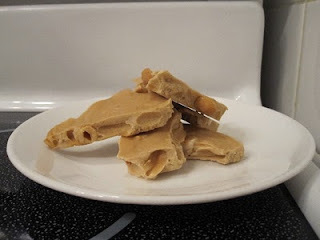 I have never made brittle or, for that matter, anything that would be considered “candy.” I've always been a bit scared of it since I do not own a candy thermometer (although I'm hoping that this Christmas will remedy that :)). However, a few weeks ago my brother asked me to make peanut brittle, wanting to be a good big brother, I decided to satisfy his craving (or try to). It seems that most brittle recipes are pretty much the same. I guess there really can't be too many variations. I chose the one with the proportions that I liked and, because I had enough peanuts, the one most easy to increase fifty percent. After reading over a few tips and making a few adjustments, such as the addition of brown sugar (I liked the idea of a molasses flavour), I thought I was ready. One problem: I forgot to take the butter out of the fridge. Not wanting to wait or roll the butter out to bring it to temperature, I went to my best friend Peanut Butter for help. Knowing how much I enjoy his company, he agreed to fill in. Waiting for the sugar to boil seemed to take forever. I really wished I had a thermometer. I realize that people were doing this long before candy thermometers but that's not how I work. I do bake with a scale after all :). I had read that if you can pull an unbroken strand of sugar about two feet long, it was time to add the peanuts. Another (awesome) tip was to preheat the baking sheet. This allows for extra time when spreading the not-yet-brittle. A great help to a person who is prone to panic, such as myself :). When I thought the sugar was ready, I dropped the peanuts and everything else into the pot, poured the mixture onto the baking sheet and hoped for the best. I realized afterwards that I didn't continue to cook the mixture after adding the peanuts. Ah well, at least it seemed to be the colour of brittle, that was something. It cooled soft or softer than what I was familiar with but it tasted good. The peanut butter flavour was subtle but noticeable, it wasn't too sweet, it was nice and creamy and there was a good amount of peanuts. But it wasn't really brittle. It was only a little more firm than a soft caramel (Krafts caramels). The next day the “brittle” was more nougat-ey or fudge-esque in texture. The day after that it was similar but much more crumbly. Maybe because of the peanut butter, maybe because the sugar wasn't ready, maybe because of my cooking faux pas, or even because of my storage method (air tight)? I don't know. Regardless, it was tastey. Granted, I did end up throwing the last few pieces out, not something that happens often. This was the first day, the top image was the second. Notice the difference in colour? All and all I suppose this was a happy failure. I made something that tasted pretty good and attempted something I had never done before. My brother never told me what he thought, but I hope he enjoyed it, at least somewhat. This definitely won't be my last brittle, it's just too simple and too delicious to not make again. Although, I wasn't really off-put by the strange texture (some were), I'm confident that next time will yield better "long term" results. Besides, I figure I'll never notice if I can finish it all on the first day :). Yields approx 1 1/2 pounds. Place baking pan in oven and set temperature to 250F. In a medium saucepan add sugar, brown sugar corn syrup, water, and salt. Turn burner to medium and bring mixture to a boil. Remove mixture from burner and stir in peanut butter (or if you're not insane, butter) baking soda and vanilla. Remove baking pan from oven, pour mixture onto pan, and evenly spread. Allow to cool completely, and then break into pieces.